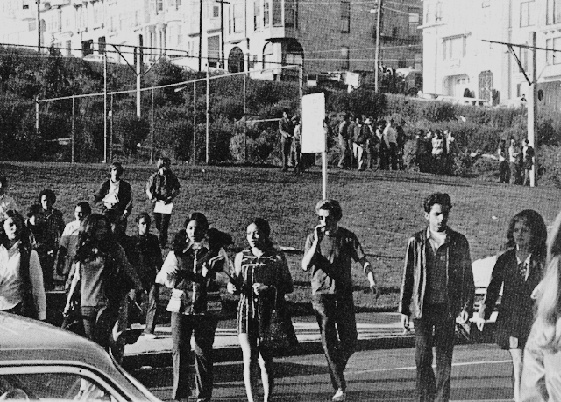 A loosely organized collective of Mission High students, Latino residents and revolutionaries has drawn up seventeen demands and will present them as a gift to strife-shaken principal Harry Krytzer. The gift will be wrapped in a student strike, starting on Monday, February 3. The police say they'll arrest anyone picketing or leafleting around the school. The Latinos and the Black Student Union (BSU) have decided to concentrate their actions a block away, meeting the kids getting off buses from the Fillmore, intercepting Latino teenagers coming up Dolores. Two weeks ago, several fights erupted between Latinos and blacks. Educational facilities are poor, or non-existent. Ten counselors for two thousand students. Police were called in. Members of the BSU shouted "Pigs off campus!" Latinos joined in the chanting. Some white students too. A few rocks found their way into policemen's mad memories. Monday, a week ago, 11th grader Francisco Flores was charged with blame for the ruckus and suspended. Community organizers Al Martinet and Jim Queen were ordered to leave the school grounds. This time the police showed up in force, with riot helmets. Some cops were surrounded by jeering students singing " jive oink-oink." Tuesday, the Administration had three meetings. White, Black, and Brown. (More than half the students are Latinos.) When shown the demands, Krytzer laughed like a corrupt bishop: "These are dreams!" A fiasco. The students were not satisfied. Martinet, Flores, Jim Queen and Johnny Gonzales were arrested for "trying to agitate the students. Thursday was a half-day. No school on Friday. Latinos and blacks set the stage for the strike. "The white students," one particularly overt chicano-cultural partisan tried to tease me, "are too stoned all the time to do anything." -Black and Latino programs of study. -Removal of hall monitors, to be replaced by teachers' aides chosen by students. -Cleaning and remodeling of cafeteria. Better food. Ethnic, food. -BSU on the Student Senate. Student faculty disciplinary court. -Removal of police around campus. Third World vice-principal. Bilingual courses. Eliminate IQ tests. And "We want all disciplinary action suspended and all truancy records removed.